Cytoplasmic gelsolin has a molecular mass of 80kDa and consists of six homologous subdomains (S1-S6). Gelsolin is a Ca++-dependent lipid binding actin regulatory protein, possessing three different actin modulating activities: severing of F-actin, nucleation of actin polymerization and capping of filaments barbed end. 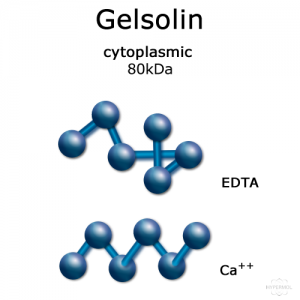 Gelsolin has three actin binding sites, two high affinity Ca++ binding sites and two binding sites for PIP2. Ca++-sensitive actin capping, nucleating and severing protein. Kd actin-binding = 50nM (barbed end). 10mM Imidazole pH 7.0, 0.2mM DTT, 0.2mM EGTA, 2mM NaN3 and 1% disaccharides, when reconstituted with 50 µl ultrapure water to obtain a 1.0 mg/ml solution. Purity: >92% by scanning densitometry from Coomassie G-250 stained SDS-Gels. 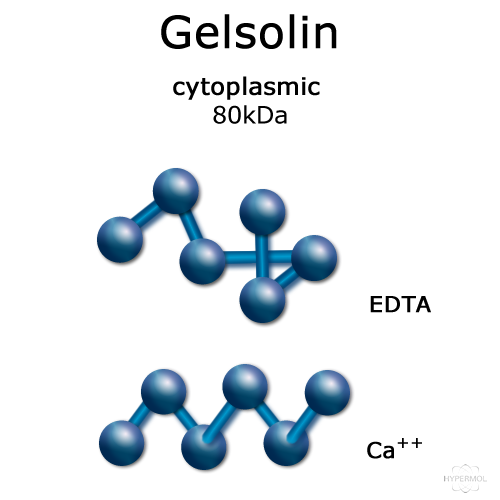 Fragmentation activity: The fragmentation activity of gelsolin was determined by Ostwald viscometry at 25°C. The specific viscosity of F-actin (1mg/ml) is reduced by ~70% after addition of gelsolin at a molar ratio of 1:100. The gelsolin stock solution was used as described below containing 1% disaccharides. F-actin containing 100mM KCl, 10mM Imidazole pH 7.4, 1mM ATP was mixed with 0.2mM CaCl2 (final concentration) prior to the addition of gelsolin. Determined by Biuret method with actin (skeletal muscle, rabbit) as reference. 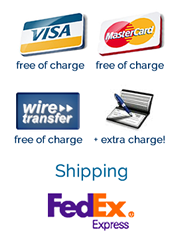 Gelsolin is stored at –70°C upon arrival will be stable in performance for at least 6 months from the date of purchase. The solubilized protein is kept on ice and should be used within 5 days. Storage in glycerol at -20°C results in a significant decrase of the activity, and has to determined individually. Please note that the structure PDB ID 1D0N is identical with cytoplasmic gelsolin, since it lacks the N-terminal extension of plasma gelsolin used for crystallization. PI3Kα-regulated gelsolin activity is a critical determinant of cardiac cytoskeletal remodeling and heart disease. Patel VB, Zhabyeyev P, Chen X, Wang F, Paul M, Fan D, McLean BA, Basu R, Zhang P, Shah S, Dawson JF, Pyle WG, Hazra M, Kassiri Z, Hazra S, Vanhaesebroeck B, McCulloch CA, Oudit GY. Nat Commun. 2018 Dec 19;9(1):5390. doi: 10.1038/s41467-018-07812-8. Ca2+ binding by domain 2 plays a critical role in the activation and stabilization of gelsolin. Nag S, Ma Q, Wang H, Chumnarnsilpa S, Lee WL, Larsson M, Kannan B, Hernandez-Valladares M, Burtnick LD, Robinson RC. Proc Natl Acad Sci U S A. 2009 Aug 18;106(33):13713-8. Burtnick LD, Koepf EK, Grimes J, Jones EY, Stuart DI, McLaughlin PJ, Robinson RC.